The New York Central Railroad in Columbus had the features of two distinct railroads. The NYC that had its roots in the Toledo & Ohio Central was a coal hauling road that ran from Charleston, WV to Toledo. The T&OC had the West Columbus Yard, a 30 track classification yard, locomotive servicing and car repair facility along McKinley Avenue in Columbus. June, 1950, the T&OC was one of the first NYC lines to completely dieselize. 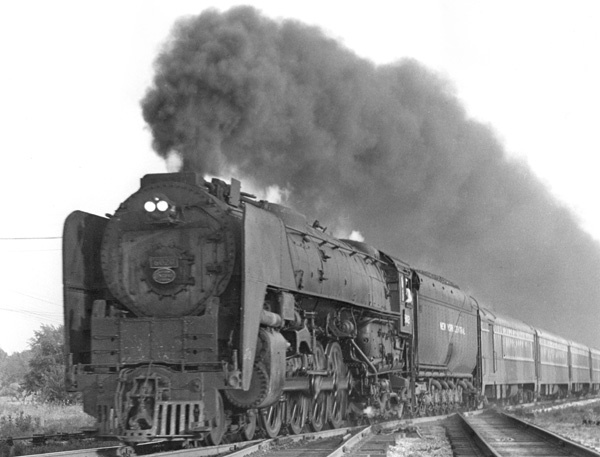 Its Toledo-Columbus passenger service ended in 1952. 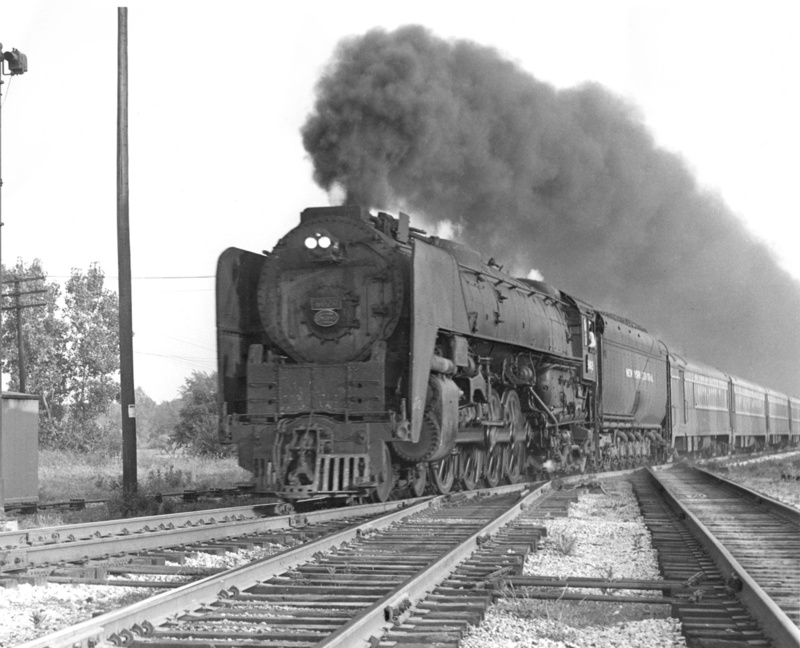 The former Big Four line between Cleveland and Cincinnati ran 10-12 passenger trains a day in the 1950s with the New York–Cincinnati Ohio State Limited the premier train. On the Big Four freight trains, mostly merchandise trains, were dieselized around 1952. Passenger trains were dieselized in 1955. 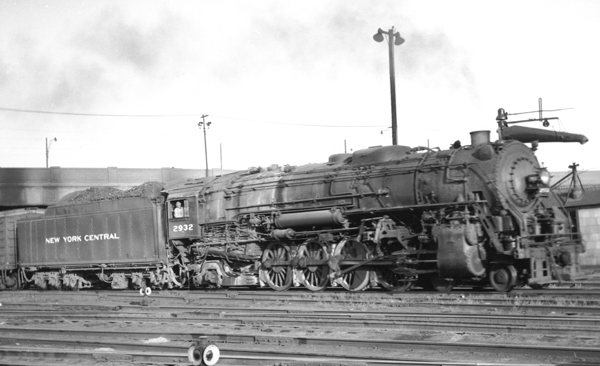 The Big Four had two small yards one on the north side of Columbus Union Station and the other next to the Ohio State Fair Grounds. Steam servicing moved to West Columbus from The Dennison Avenue roundhouse before WW II when both the T&OC and Big Four joined the NYC family. The T&OC and Big Four shared a coach yard at Dennison Avenue. U-3, 0-8-0 - Used for switching and transfer duties in Columbus. The NYC had 1175 switchers with the U-3 the most common switcher in photos taken in Columbus after 1945. U3 No. 7883 is taking on water in the Columbus Yard. Photo by Donald A. Kaiser July 27 1952. 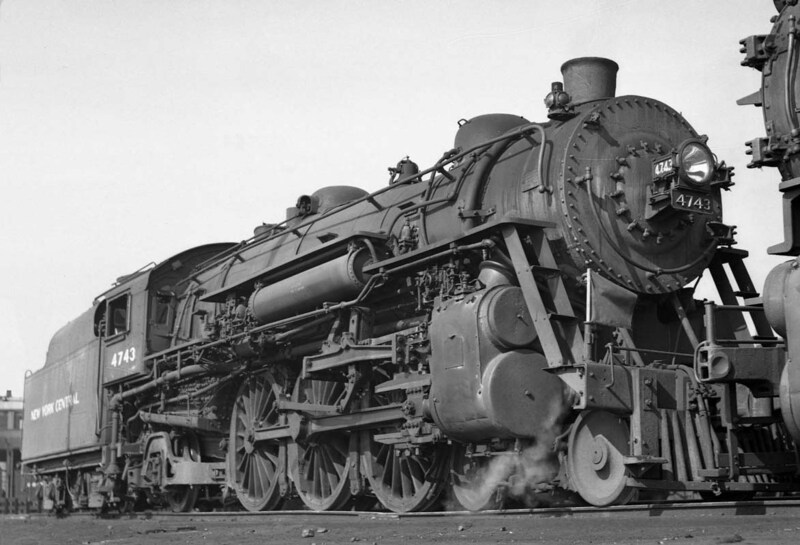 G-46, 2-8-0 – For the most part the Mikado 2-8-2 replaced the Consolidations on the NYC especially as road locomotives before WW II. However, the 1947 Employee's Timetable still listed instructions for the G-46 class locomotives. 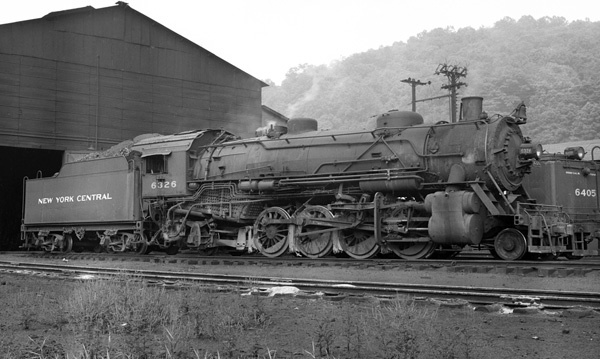 If the NYC was still using any 2-8-0's after WW II it most likely was in the coal fields in southern Ohio or perhaps the docks at Toledo. No. 5563 a classic New York Central Consolidation. It is not necessarily a G-46 but it illustrates the problem with consolidations and why the NYC went to the 2-8-2 design. The rear driver and firebox conflict. 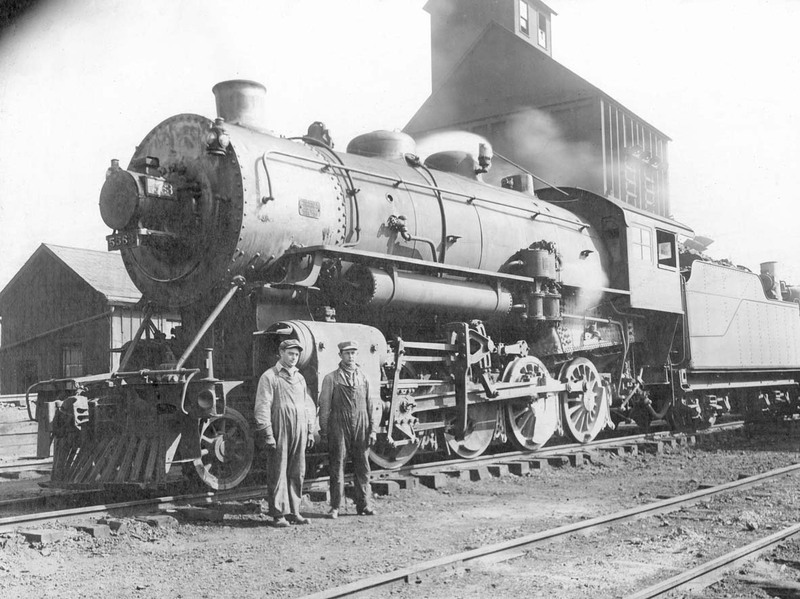 Either the firebox could be large or the driver diameter large, but not both. The answer was to move the firebox back and support it with a trailing truck. H-5, H-6, H-10, 2-8-2 – The Mikados replaced the Consolidations and at their peak numbered over 1000. They saw service on both the T&OC and Big Four through Columbus. Even though they were supplemented with the 4-8-2 Mohawks they weren't totaly replaced in Columbus until the diesels came along. The Mikados also served as helper locomotives. H-6 No. 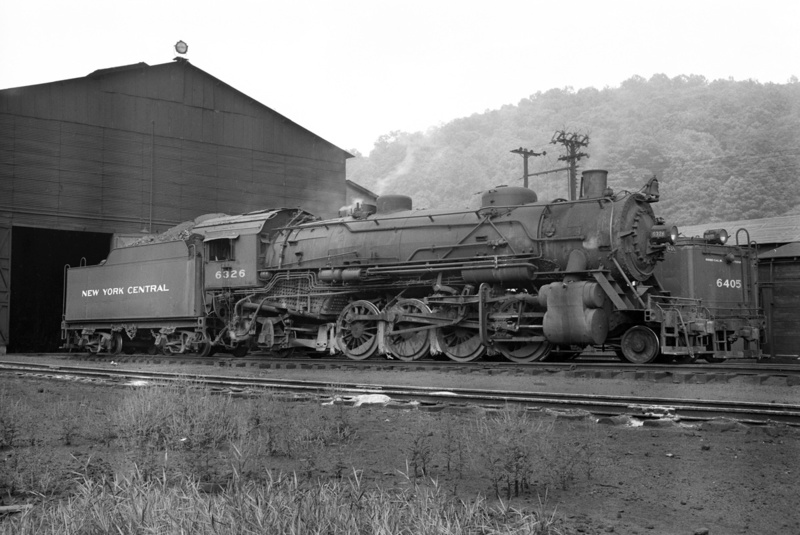 6326 at Rainelle, WV, September 1954. Photo by Donald A. Kaiser. L-1, L-2, 4-8-2 - Freight Locomotives - The NYC was known as the “Water Level Route” because it followed the river valleys across New York State lessening the need for a mountain climbing locomotive like the C&O and N&W used. 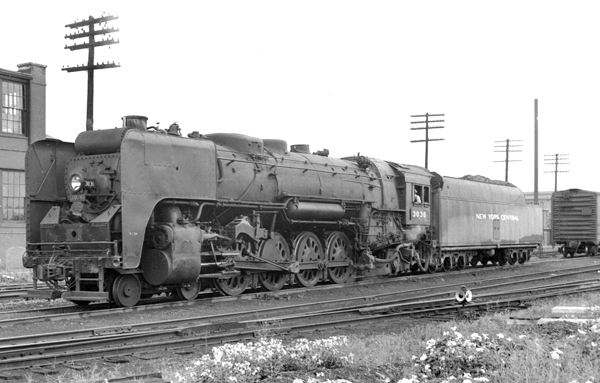 Instead the smaller L-1 & L-2 served as the New York Central’s big freight locomotive. The four wheel front pony truck allowed for higher speeds than the H class 2-8-2 provided. During times of peak passenger train usage the L-2’s were used on passenger trains, later leading the way to the dual usage L-3 and L-4. Westbound L-2 No. 2932 passing under the Fourth Street Bridge, Columbus, Ohio, October, 1952. Photo by C.A. Buehler from the Gary D. Rolih Collection. L-3, L-4, 4-8-2 - The L-3 and L-4 were used on passenger trains through Columbus. The quick way to tell the L-3 and L-4 from the earlier L-1 and L-2 were by their smoke deflectors nicknamed “Elephant Ears”. These dual usage Mohawks gave the NYC a flexible locomotive that could haul either a passenger of freight train. L-3b No. 3036 at the Findlay Street Yard, Dayton, Ohio, September 1952. Photo from the David Oroszi Collection. L-3a Nos. 3000-3024 dual svc. 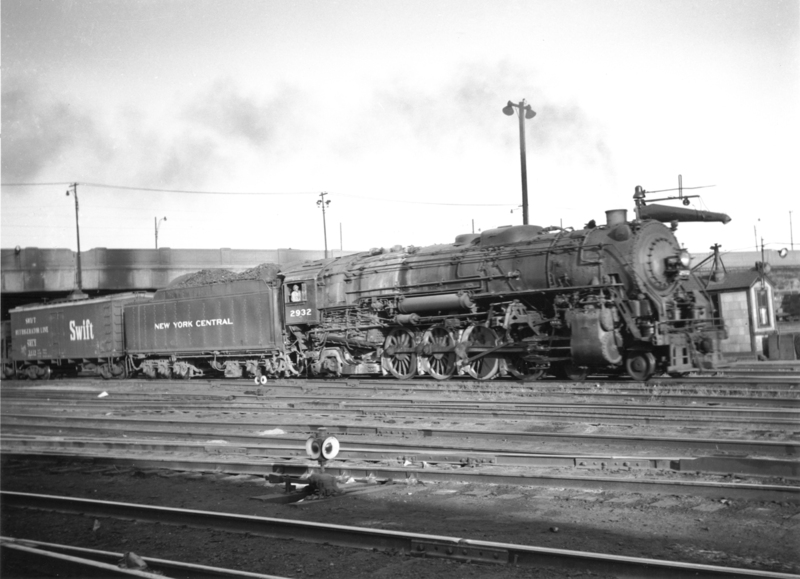 401,100 lb Boiler Pressure: 250 lb Builder: Lima Locomotive Co.
K-3, K-5, K-11 4-6-2 – Post-WW II Pacific locomotives would have been used on the T&OC passenger trains and could have appeared on the Big Four in the 1940s. By mid-1950s the larger passenger locomotives were in use on the Big Four through Columbus. J-1, 4-6-4 – There were 275 4-6-4 Hudsons built starting in 1927. 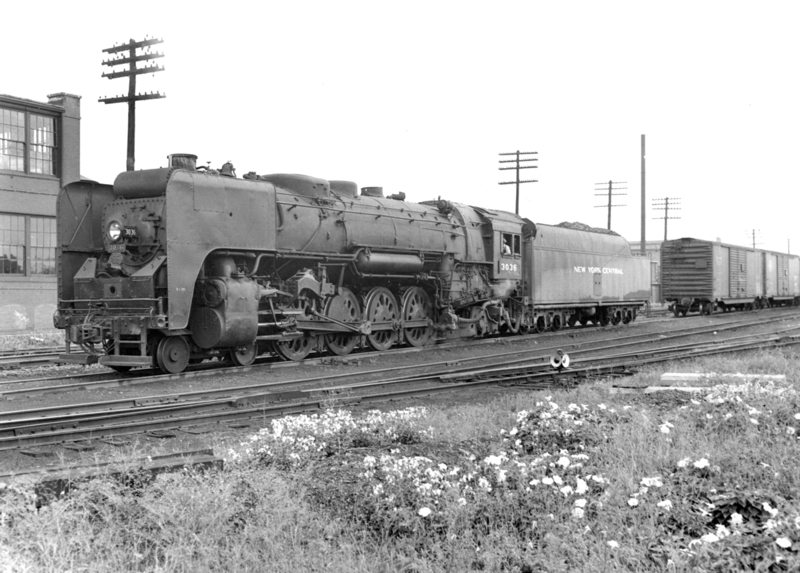 They replaced the K class 4-6-2 on named passenger trains that had become too heavy for the lighter Pacific locomotives. They were to remain in service until the end of steam on the NYC. Every kid wanted the Lionel’s version of the Hudson under their Christmas tree in the 1930-50s. J-1 Hudson No, 5376 leaving Columbus Union Station bound for Cleveland. Photo by G. Graybill, Jr, September, 1936. 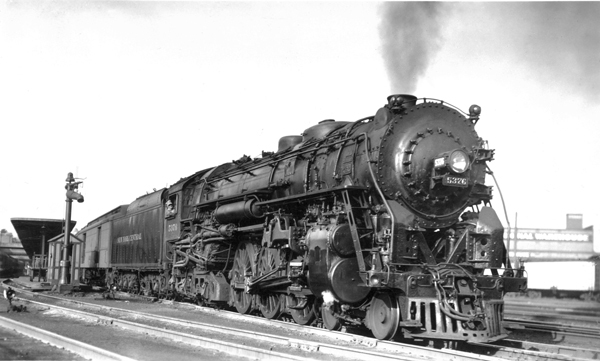 S-1, S-2, 4-8-4 – In 1945 and 1946 the NYC took delivery of 27 massive passenger locomotives, the 4-8-4 Niagara class. They were an improvement over the Hudson and Mohawk locomotives as well as competitive with the diesels except in one way – costs. By 1955 their time was over as the diesel had won the battle. One feature of the Niagara that excited the railfan was its ability to scoop water at 80 mph. The tenders have special vents located under the tender bed along each side that let air escape while scooping water. The pipes also served as overflow vents when the tender was filled. That’s when you did not want to stand too close to the track. Train No. 424, the eastbound Cincinnati Mercury headed by NYC Niagara No. 6020 crossing the Worthington interlock bound for Cleveland. Photo by B.J. Kern, circa 1952.